Concurrent use decisions are as rare as a traffic cop in Boston, but the TTAB has just issued its decision in Hubcap Heaven, LLC v. Hubcap Heaven, Inc., Concurrent Use No. 94001147 (January 25, 2005) [not citable]. In an otherwise mundane ruling, the Board raised an interesting question regarding the continued viability of the concurrent use registration in view of growing use of the Internet by businesses large and small. 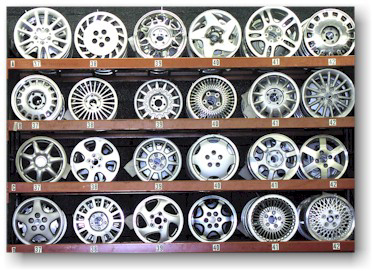 The Board ruled that Applicant Hubcap Heaven LLC of Suitland, Maryland, is entitled to a concurrent use registration for the service mark HUBCAP HEAVEN for "wholesale and retail store, mail order, and on-line electronic catalog sales order services in the field of new, reconditioned, and used automotive parts." (HUBCAP disclaimed). Applicant was awarded the entire United States except for the areas within a 50-mile radius of four cities: Pittsburgh, Memphis, Virginia Beach, and Metairie, Louisiana. Applicant's 1993 registration for the same mark for "automotive hubcaps, wheel covers, and wheels" was also part of the proceeding, and it was likewise geographically restricted. Applicant began its business in 1979, when a "huge snowstorm in the Washington DC area result[ed] in roads with potholes which in turn resulted in hubcaps all over the roadside." The enterprising Jackson brothers gathered up some 800 hubcaps and began selling them "on a street corner near a carwash (where their sister worked) in Marlow Heights, Maryland." Eventually, the trio leased a building in Suitland, Maryland (1984), and then the business expanded to stores in Alexandria, Virginia (1991) and Hyattsville, Maryland (1996). Applicant distributes a catalog on the East Coast, and operates a website (link above). Applicant listed the four locations of the Excepted User (and defendant) Hubcap Heaven, Inc., "because user assertedly used the mark HUBCAP HEAVEN in those four locations prior to November 15, 1990, the filing date of the application that matured into applicant's involved Registration." Plaintiff's subject concurrent use application was filed on October 13, 1995. However, the Board observed that, because User does not have a federal application or registration, priority is not an issue: "applicant's use obviously is 'prior to' any theoretical future filing by user." Applicant thus satisfied the "jurisdictional requirement" or "condition precedent" for a concurrent use proceeding: use in commerce before User's filing date. See TBMP Section 1103.01(b). "We acknowledge that the juxtaposition, on the one hand, of use of a mark on the Internet, and on the other hand, the seeking of a geographically restricted registration is troubling. Indeed, in the age of the Internet, concurrent use registrations premised on geographically distinct uses appear to be a legal fiction as the Internet is accessible not only nationwide but world-wide." But the Board noted that there is "little judicial precedent or guidance" as to the impact of Internet websites on trademark infringement suits or concurrent use proceedings. It declined to create an absolute rule barring geographically restricted registration when one or more of the parties does business via the Internet. Instead, the Board must look at the facts of each case. "Here, there is no evidence of applicant achieving sales to consumers in any of user's four excepted territories. Moreover, consumers are becoming more computer and Internet-savvy and they are likely to understand how business is done on the Internet. Thus, the fact that a business has a website does not necessarily mean to consumers that the business is a nationwide business." Therefore, the Board found that Applicant established "jurisdictional" priority and that confusion is not likely, "notwithstanding that applicant does business on the Internet." The TTABlog notes that, although use of the marks on the Internet had little impact in this concurrent use proceeding, other, more vigorously contested proceedings may well make it clear that concurrent use registrations are, in this Internet Age, a dying breed.